When is vro exam ? How to prepare for vro exams ? Will you send model papares to my mail id ? Re: When is the VRO entrance exam? How to prepare for it? Model question papers? When is vro exam ? How to prepare for vro exams ? Will you send model papares to my mail id? We have a Village Revenue Officers exam as on 30Th/January/2012(10:00AM to 12:00Noon). From General Studies 30 Marks of Questions comes on rural areas and rural area condition related questions. In General Studies,30 Marks of questions comes on Rural Area related questions,You should more concentrate on these questions,To get a good score in exam. For Arithmetical Skills,You should learn Basics of Arithmetic and Tables up to 20Tables,Speed Calculations. You should cover every concept of arithmetic don't go to in depth.Questions are very easy for arithmetic. Only practice is only the key point to solve the questions with in time. For This concept ,You should have a grip on analogy,odd man out,Puzzle test,blood relation,etc..
To appear for VRO exam,you should have complete 12th class with any stream from a AP Board and your age should be between 18 to 34 years. If you belong to obc/general category,then you should pay Rs.200/- for VRO exam. If you belong to sc/st category,then you should pay Rs.100/- for VRO exam. You should pay the fees in E-Seva/Mee-Seva/AP online centers only before 27th Dec 2011. >>VRO exam will held on 30th Jan 2012 from 10am to 12 noon. So concentrate more on General studies of Rural Area. All the question will asked on 12th standard base only. what type of questions are asked in the exam related to rural areas in general studies aspect? As there is less time, prepare well. ALL THE BEST FOR UR EXAM! Vro exam will be held on 30.01.2012 (10am to 12 noon). You can submit online form fill up from 7th december to 27th december. you can prepare in those following subject from taking admission in any institute .there you can prepare for vro exam. when is the VRO entrance exam?How to prepare for it?Model Question papers? THE VRO/VRA EXAM IS TO BE HELD ON 30 OF JANUARY, 2012. ~How to prepare for it? - If you have applied for the VRO or VRA exam, then you have to give an written exam of objective pattern. - You have to study according to the syllabus fixed for the exams. 1. General knowledge of 60 numbers. 3 Logical Skills of 10 marks. - Andhra Pradesh Revenue department has published model papers for the VRO and VRA position. AP board or equivalent. The age of the candidates should not more than 34 years and should not more than 18 years. their will be relaxation of 5 years for the candidates belonging to SC/ST/BC candidates. be of objective type question. Those candidate have completed 12th standard are eligible for VRO exam. Those candidate have completed 10th standard are eligible for VRA exam. FOR VRO- Your are should be in between 18 - 34 years. FOR VRA- Your are should be in between 18 - 34 years. Exam is of 2 hours and number of question is of 100. i.e, 100 questions have to answer in the time of 120 minutes and there are no negative marks. The last date of submission of form---30.04.2012. It was mentioned in the VRO and VRA recruitmet notification that there will be 10 questions on Logical Skills in the written test to be held on 30th January 2012. Questions in this section will be from the topics of simple logical skills and reasonong ability. Candidates can concentrate on practicing more and more old question papers of the examinations of similar nature. Other crucial section in the written examination is Arithmetic Skills, which has 30 marks weightage. Apart from these, General Studies and questions on issues and life style related to villages are given 60 marks weightage. 1) The day after the day after tomorrow is four days before Monday. What day is it today? 2) 1, 1, 4, 8, 9, 27, ? (5) If the data in both statements I and II together are necessary to answer the question. 1) How many students are there in the school? I. The number of boys is 90 more than that of girls. II. The percentage of boys to the percentage of girls is 145. 2) What is the two digit number? II. The unit's digit is less than the ten's digit. 3) What is the rate of compound interest? 4) How is M related to P? II. The only shild of D and K is M.
5) Who is the immediate right of Mohan when Mohan, Salil, Bhushan, Suresh and Jayesh are sitting around a circle facing at the centre? II. Bhushan is between Salil and Jayesh. 1) The average age of students of a class is 15.8 years. The average age of boys in the class is 16.4 years and that of the girls is 15.4 years. The ratio of number of boys to the number of girls in the class is? 2) The average ages of three persons is 60 years. Those ages are in the proportion of 1:2:3. What is the age of the youngest one among them? 3) By selling an article for Rs. 100, one gains Rs. 10. Find out the gain percent. 4) The population of a town is 176400. It increases annually at the rate of 5 percent per annum. What will be its population after 2 years? 6) The least number of five digits which is exactly divisible by 12, 15 and 18 is? 7) 9639 - 3098 = 8067 - ? 8) 8563 + 3792 + 4085 = ? 9) 8888 + 888 + 88 = ? 10) Pointing to a man, a woman said, 'His mother is the only daughter of my mother'. How is the woman related to man? Andhra Pradesh Candidates have a Village Revenue Officers Exam as on 30Th January/2012.Time of Examination is 10:00AM to 12:00 Noon. You should mark OMR sheet with Black Point Pen or Blue Pen. Questions paper consist 100 Questions,These 100 Questions you have in telugu medium. Model Paper link from Official Website is http://ccla.cgg.gov.in/NOTIFICATIONPDFs/Model_vro.pdf. 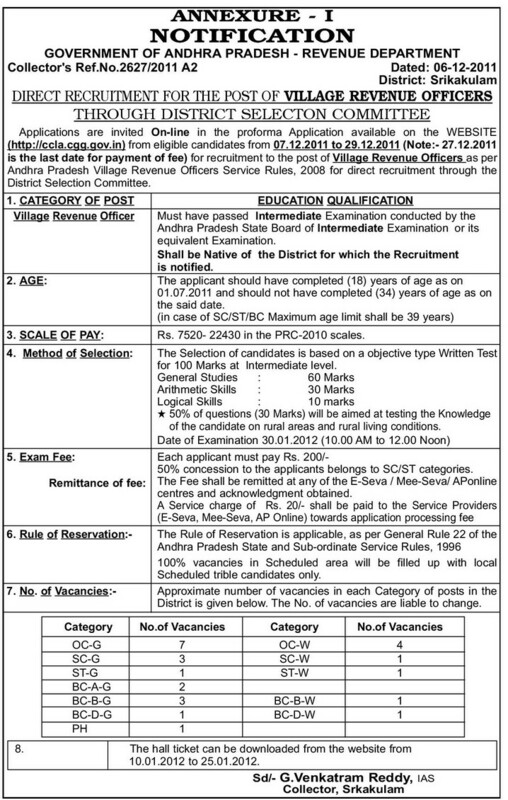 As asked about the date of exam for the post of Village Revenue Officer, it will be held on 30th January, 2012. The duration of exam is two hours i.e. it will be from 10.00 A.M to 12.00 P.M. The paper will have three parts and it will be of total 100 marks out of which General Studies will be of 60 marks, Logical skills will be of 10 marks and the Maths portion will be of 30 marks. In General studies mostly questions will be relating rural areas about rural things. General studies consists of History, Economics, Gen. Science, Curre3nt Affairs and Geography etc. For Maths, the candidates should prepare the basics of Arithmetic and simple questions up to the standard of 10th class. Simple questions of ratio and speed etc. will be in Arithmetic paper. For Logical skills, the candidates should be prepared with knowledge of blood relations and should do practice for puzzle test. 2. Exam Day time: 10 am to 12 noon. 3. Exam duration: 2 hours. 4. Total marks: 100 marks. Exam Date: 30 th of jan, 2012. Upper age limit relaxations for SC/ST/BC are 5 years. 1.Make a schedule a follow it every day in this way you will be in touch with all subjects .Study at least 6 hours a day and try to touch every subjects . 2.Make notes to prepare for the exam.It will help you in quick revision . 3.As the arithmetic questions are asked in the examination so practice as much as you can . 4.Solve previous year questions papers and model papers to do practice for the exam. 5.Use pencil and mark every important dates you find during general studies .It helps in quick revision . I have attached the previous year papers of the VRO exam i hope it will help you to prepare for the exam. When can I write TRB exam? Important dates for it?